Over the past 24 hours, Armenia’s armed forces have 129 times violated the ceasefire along the line of contact between Azerbaijani and Armenian troops, the Azerbaijani Defense Ministry said July 8. The Armenian armed forces were using 60-mm and 82-mm mortars and 122-mm D-30 howitzers (32 shells). The Azerbaijani army positions in the Kohnegishlag village of the Agstafa district, Kamarli, Qaymaqli, Farahli and Bala Jafarli villages of the Gazakh district underwent fire from the Armenian army positions located in the Shavarshavan village and on nameless heights of the Noyemberyan district, as well as the Paravakar village and on nameless heights of the Ijevan district of Armenia. 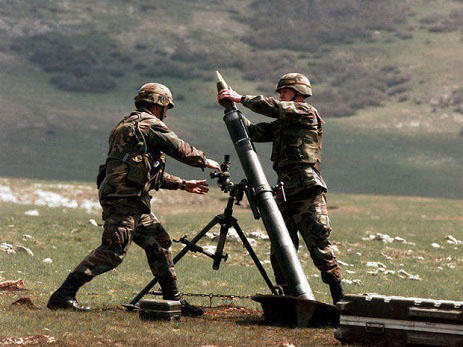 Meanwhile, the Azerbaijani army positions on nameless heights and in the Aghdam, Kokhanabi villages of the Tovuz district of Azerbaijan were shelled from the Armenian army positions located on nameless heights and in the Aygepar and Mosesgekh villages of the Berd district of Armenia. The Azerbaijani army positions in the Zamanli village of Azerbaijan’s Gadabay district also underwent fire from the Armenian army positions located on nameless heights of the Krasnoselsk district of Armenia. Moreover, the Azerbaijani army positions were shelled from the Armenian positions located near the Armenian-occupied Goyarkh, Chilaburt and Yarimja villages of the Tartar district, Bash Garvand, Javahirli, Garagashli, Sarijali, Novruzlu and Marzili villages of the Aghdam district, Kuropatkino village of the Khojavand district, Ashagi Veysalli, Gobu Dilagarda, Garvand, Garakhanbayli, Ashagi Seyidahmadli, Gorgan and Horadiz villages of the Fuzuli district, Nuzgar and Mehdili villages of the Jabrayil district, as well as from the positions located on nameless heights of the Goranboy, Tartar, Aghdam, Khojavand and Fuzuli districts of Azerbaijan.